Hickory petiole galls produced by Phylloxera subelliptica (family Phylloxeridae) are appearing on hickory in southwest Ohio. The single-chambered, ball-like galls range in size from 1/4 - 1/2" in diameter and arise from leaf petioles as well as along leaf midveins. They may occur singly or in clusters to hang grape-like from their namesake host. The galls range in color from solid greenish-white to bi-color forms involving splashes of reddish-pink. Fully mature galls split open at to release the phylloxeran adults through a longitudinal slit. Spent galls either dry out to become whitish structures that retained the gall's general size and shape, or they became shriveled, brown, collapsed husks. 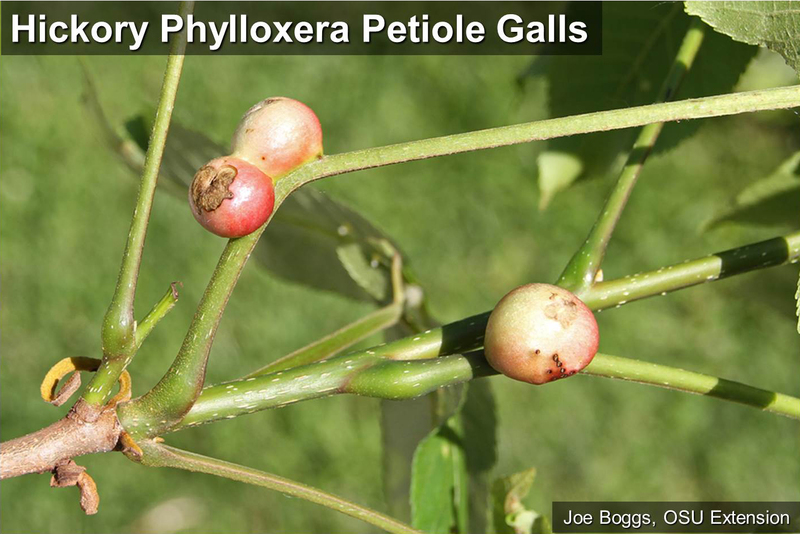 The galls are not the same as the notorious HICKORY LEAFSTEM PHYLLOXERA GALL produced by P. caryaecaulis. Hickory leafstem Phylloxera galls are much larger, sometimes measuring almost 1" in diameter. They often have multiple chambers joined together into a single, lumpy gall-mass. Their formation and development may be highly destructive causing significant twig dieback. The petiole galls are much less destructive although they can produce deformed leaflets and induce severe twisting of hickory petioles.